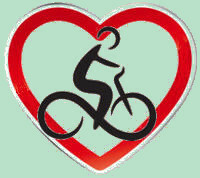 ﻿ Tourism and Sightseeing when staying at Provence Cycling Holidays, self guided bike tours in the Luberon, Provence, France. VILLA-BASED TOURS - TOURISM & THE SIGHTS. The Luberon and Provence provide a great environment for cycling and outdoor living with superb countryside and stunning, intriguing stone villages. In the relatively small area of the Luberon Park alone, we have four of France's classified "Most Beautiful Villages"; Roussillon, Gordes, Menerbes & Lourmarin. Plus a handfull of other villages that should be clasified too. The area has a varied terrain: from the flat orchard filled river plane, rolling vine covered hills to quiet, long, spectacular climbs. Throw in the beautiful Provencal architecture and the quiet country back roads and it should make for some of the best cycling you have'll ever experienced. We'll provide you with our own "Real Provence" guide to the area; with all the popular places to visit (as well as the lesser known but equally good sights), our favourite restaurants and cafes, vineyards, etc. Whatever your interests, just let us know and we will be happy to show you the ride that will take you where you want to go. Of course if you've had enough cycling the car is always an option, as there is lots to see just a little further afield. Roussillon: Visit the beautiful village and its famous Ochre mines. 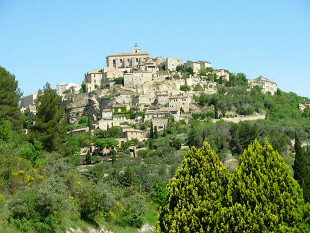 Gordes: Spectacular hill village with great views. Oppede le Vieux: A unique, charming, old village that was half destroyed by an earth quake - there's a great walk from the village square up through the half destroyed houses to the Castle & Church. Relatively unknown, but definitely worth a visit.Image to the left. Goult: A very old, beautiful village, off the tourist track, great restaurants & village cafe and an interesting walk around the oldest part of the village. 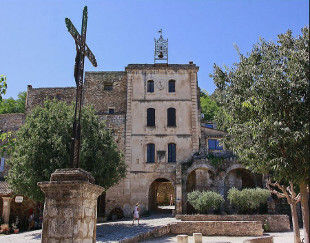 Lacoste: A quiet and impeccably well preserved village, with a great walk up through the historic village architecture to the Marquis de Sade's Chateau that sits atop the village, dominating the valley below. 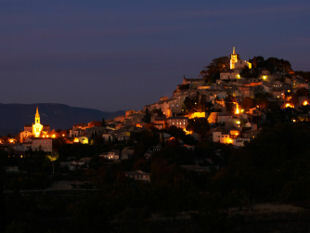 Menerbes: The archetypal Luberon village - made famous by the book "A year in Provence" - nice restaurants, views & walk. Lourmarin: Beautiful village set at the entrance of the hilly ravine pass. Fontaine-de-Vaucluse: Picturesque village, famous for the crystal clear water source that originates here and flows onto L'Isle sur la Sorgue. Nice walk up to the water source with plenty of restaurants, cafes and shops along the way. You can even hire a canoe or fishing rod! Also has a very interesting French Resistance museum. Isle sur la Sorgue: Walk along the many interesting water ways of the "Venice of Provence" & browse the dozens of antique shops or just take a seat and enjoy a superb ice cream in the sun by the river. Vineyards - Try some wine tasting at the numerous, excellent, local vineyards. Markets - The choice is large with a market somewhere almost everyday, there's an excellent farmers market on the Sunday in Coustellet, and a huge resellers market in Apt on the Saturday morning. Fort de Buoux - An abandoned ancient village and fortress high on a stony outcrop - really interesting. The Cedar Forest - at the top of the Luberon hills, great for a picnic. 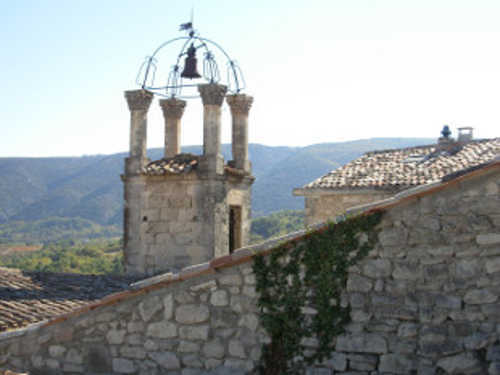 "Conservatoire des Terrasses" and its centuries old stone agricultural buildings. Abbaye de Sénanque - The famous, impeccably preserved 12th-century Cistercian Abbey. Mont Ventoux - Probably the most famous mountain climb in the Tour de France. Take a drive up it, or if you're feeling fit join the others for the 2-hour grind up Cycling Mecca. Roman sites - Pont du Gard (aquaduct), Glanum (excavated ancient village), Arles (Roman arena, theatre, baths & cemetery) & Nîmes (Roman arena, buildings). Towns - St Remy de Provence, Avignon, Aix en Provence. Sights - Les Baux de Provence, Château de la Barben, Zoo de la Barben, Vineyards (eg Châteauneuf du Pape, Gigondas). Mediterranean beaches - Cassis, Bandol, Sainte Marie de la Mer etc. "We had a wonderful 6 days cycling in Provence. Neil designed great rides each day to match our ambitions that took in wonderful villages, great lunch spots and wonderful views." Adrian - NZ - Oct 13. "Neil's knowledge and obvious love of bikes and the region helped to make our holiday a most memorable time." Kim & Annemarie - Australia - May 11. "Great cycling in beautiful surroundings with some great places of interest to visit." Pippa & Dave - UK - July 10. "Neil knows the area so well and keeps you on beautiful, quiet, country roads. 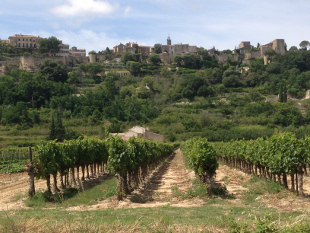 We passed vineyards, olive groves, lavender and travelled through beautiful Provencal villages." Donna - US - June 10. "Neil's knowledge of the area is a great asset and proved to be invaluable. His recommendations for days out and places to dine were readily taken up and we were never disappointed." Mark & Gill - UK - June 09.